In choosing the future route of an improved, high-speed Northeast Corridor, it is important to address the disparate needs of the southern and northern sections individually. For instance, while the southern section of the Northeast Corridor is owned by Amtrak in its entirety and can be improved as needed, the northern section is owned by a variety of different railroads with differing needs. Further, the current southern section of the Northeast Corridor travels through every major city in between Washington and New York. The current northern section, on the other hand, bypasses some of the largest population centers in between New York and Boston and travels along a relatively unpopulated, yet curvy section of eastern Connecticut and southern Rhode Island. 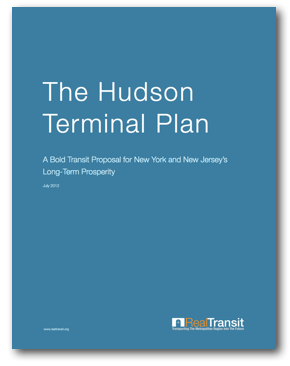 There are, however, are a number of standards that should guide planning across the entire Northeast Corridor. For example, any future high-speed route in the Northeast Corridor region needs a dedicated right-of-way to achieve the fastest travel times with the least congestion from other freight or commuter railroads. Achieving higher speeds also requires that any intermediate station stops allow for bypass tracks for express trains. In addition, large capital investments in the Northeast Corridor’s infrastructure must also add value to the overall system by expanding markets and creating new demand throughout the broader Northeast Corridor region. 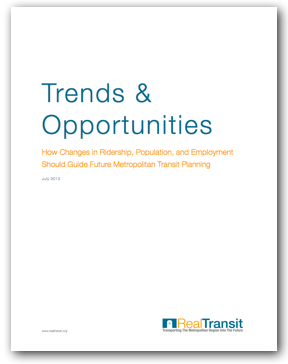 Achieving this goal must include the incorporation of strategic transit-oriented developments as well as connections for local transportation systems. In sum, if the United States is preparing to invest tens of billions of dollars in its intercity passenger rail infrastructure over the course of several decades, it must get its money’s worth by ensuring that improvements result in comprehensive benefits for entire regions of the country as opposed to limited improvements for limited populations. 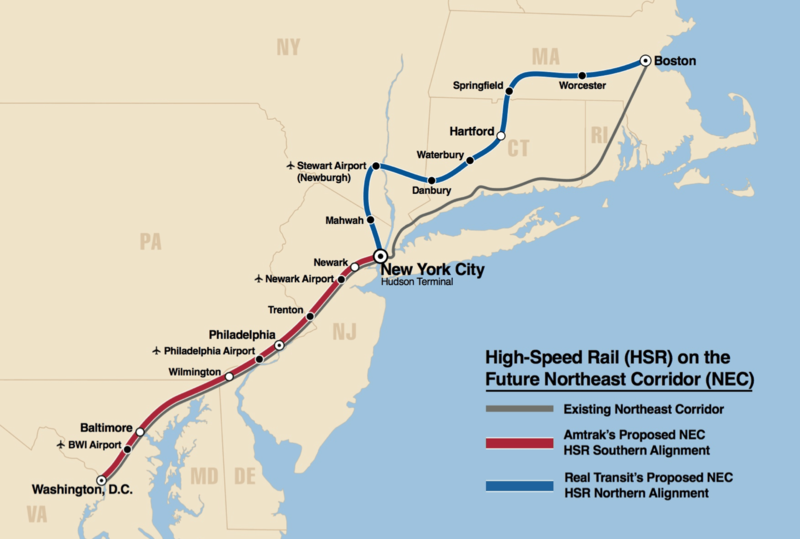 Compared to the northern section of the Northeast Corridor, the southern section of the Northeast Corridor was built to accommodate high-speed rail, and incremental improvements can go a long way towards achieving faster and more efficient service. For instance, in 2011, the US DOT granted Amtrak $450 million to implement the New Jersey High- Speed Rail Improvement Program (“NJHSRIP”), which will upgrade and improve the catenary, power, track, and signal systems on the Northeast Corridor primarily between New Brunswick, NJ and Trenton, NJ. These improvements will facilitate increased speeds and improved reliability for all users of the Northeast Corridor and will eventually lead to higher levels of service for both Amtrak and NJ Transit. The NJHSRIP is scheduled to be completed in 2017, and Amtrak has already begun testing trains at speeds of 165 miles per hour along the segment of track. 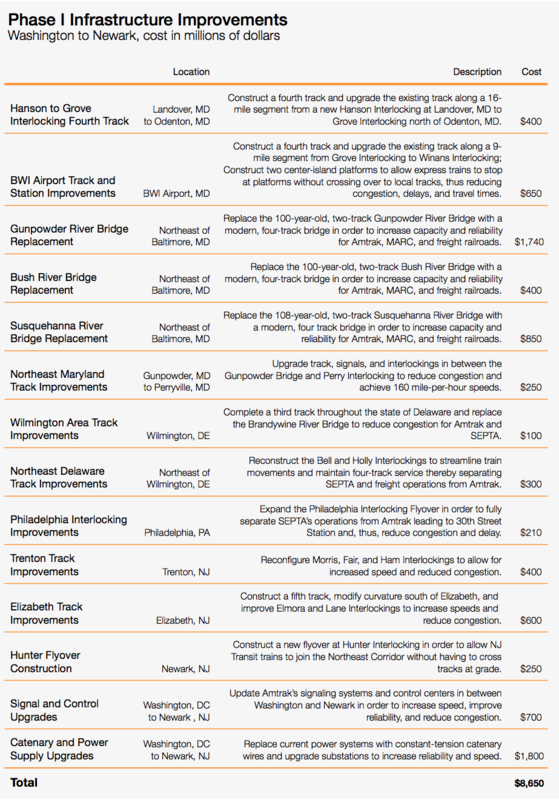 Phase I improvements along the remainder of the southern section of the Northeast Corridor will mirror the sorts of improvements being implemented by the NJHSRIP. Constructing constant-tension catenary wire, improving signaling systems, and modifying curves across other key segments of track will help to increase current maximum speeds throughout the entire southern section of the Northeast Corridor. In addition, the replacement and rearrangement of a number of key interlockings throughout the southern section of the Northeast Corridor would improve travel times through congested bottlenecks in southern New Jersey, eastern Pennsylvania, and Delaware. Even using current train sets and the Northeast Corridor’s existing right-of-way, an initial phase of improvements can go a long way towards increasing maximum train speeds to 160 miles per hour across a large portion of trackage in between Washington and Newark. The total cost of Phase I improvements is estimated to be $8.7 billion over the course of approximately ten years. 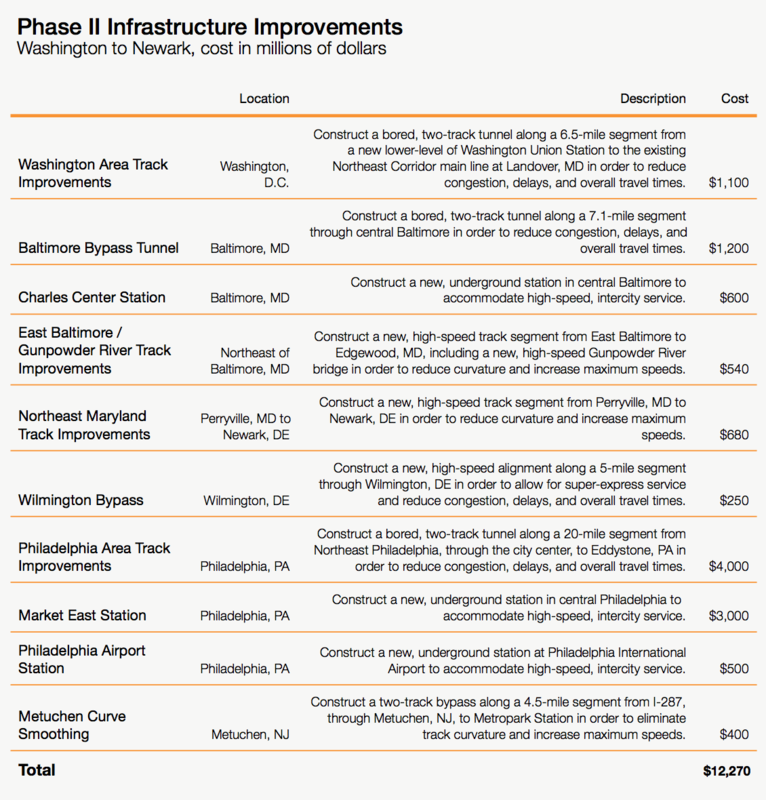 As outlined more specifically on the next page, these improvements will allow for increased train speeds and reliability as well as decreased congestion, thus reducing overall travel times along the southern section of the Northeast Corridor. Average speed limits would increase from 97 miles per hour to approximately 120 miles per hour including several segments of track allowing speeds over 150 miles per hour. Improvements to signaling and track capacity would further increase average speeds. Travel time from Newark to Washington would drop by a half hour to under two hours. Travel time from Newark to Philadelphia would drop to under 40 minutes, and travel time from Philadelphia to Washington would drop to under 80 minutes. Achieving even faster speeds along the southern portion of the Northeast Corridor will require significant infrastructural improvements in order to completely separate high-speed trains from slower commuter and freight trains, which have caused increasing congestion and delays over the past several decades. Among the 1.2 million people in the Northeast Corridor region who get to work by commuter rail, 62% of passengers and 53% of trains travel along at least some portion of the Northeast Corridor. Further, freight interference has increased nearly ten-fold over the past 20 years. 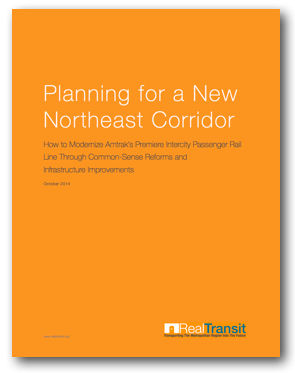 The simplest way to increase capacity and reduce delays along the southern section of the Northeast Corridor is through the construction of new, independent alignments that are able to bypass congested urban cores and, thus, achieve faster speeds. However, because of existing buildings and structures, the addition of tracks to the current Northeast Corridor right-of-way would require significant property acquisitions that would unavoidably drive up costs. In addition, the greatest drops in speed occur as tracks pass through the center of a city as existing infrastructure bends around century-old alignments in order to access a given city’s station. Finally, in between express stations, curve smoothing must be performed to allow high-speed trains to reach greater speeds in order to reduce intra-station travel times. In July of 2012, Amtrak announced a $7.5 billion master plan to redevelop and improve Washington Union Station. The 20-year plan proposes changes that would not only improve the passenger experience through the construction of a new train shed and concourse spaces, but also increase overall train capacity and allow for the accommodation of high-speed train service through the station with the construction of a lower track level. Amtrak proposes that this lower level of trackage would be connected to the southern section of the Northeast Corridor by means of a bored tunnel traveling northeast from the redeveloped Union Station to the vicinity of the Anacostia River. In addition to the Washington Union Station Master Plan, Phase II improvements along the southern section of the Northeast Corridor require the bypassing of several downtown stations in order to avoid a bottleneck of congestion and reduced speeds. In Baltimore, a new deep-bore tunnel through the city center would be constructed to bypass the 140-year-old B&P Tunnel as well as the existing tight curves of the original station approach. In the middle of the new tunnel, a new Charles Center Station would be constructed in the center business district with direct access to the inner harbor, convention center, and Camden Yards. The new station would also provide links to the Baltimore Metro Subway and Light Rail systems. Overall, the new Charles Center Station and tunnel would increase maximum speeds from 30 to 55 miles-per-hour through Baltimore to above 150 miles-per-hour, cutting travel time between Baltimore and Washington in half and dramatically increasing demand. An additional track bypass would be constructed over a 20-mile segment from Perryville, MD to Newark, DE in order to increase speeds from 130 miles per hour to 220 miles per hour. A similar bypass would also be constructed in Delaware, which would allow express trains to completely circumvent the tight curves and reduced speed limits around the Wilmington Station area. For trains approaching Philadelphia from the south, the four main line tracks of the Northeast Corridor are joined by two SEPTA tracks at Phil Interlocking. Of these six tracks, one track ends, one track branches off to the South Philadelphia Freight Yard, and two tracks join another SEPTA line that travels through the upper level of 30th Street Station, thus leaving just two Northeast Corridor tracks to terminate in Philadelphia. Leaving Philadelphia towards New Jersey, the two Northeast Corridor tracks are once again joined by two SEPTA tracks. North of the city, another SEPTA line diverges from the Northeast Corridor at Lehigh Interlocking just below the North Philadelphia Station. These divergences and convergences of track occur over the course of numerous tight curves through densely populated areas. Accordingly, achieving faster speeds through Philadelphia requires the complete bypass of the existing Northeast Corridor and 30th Street Station. 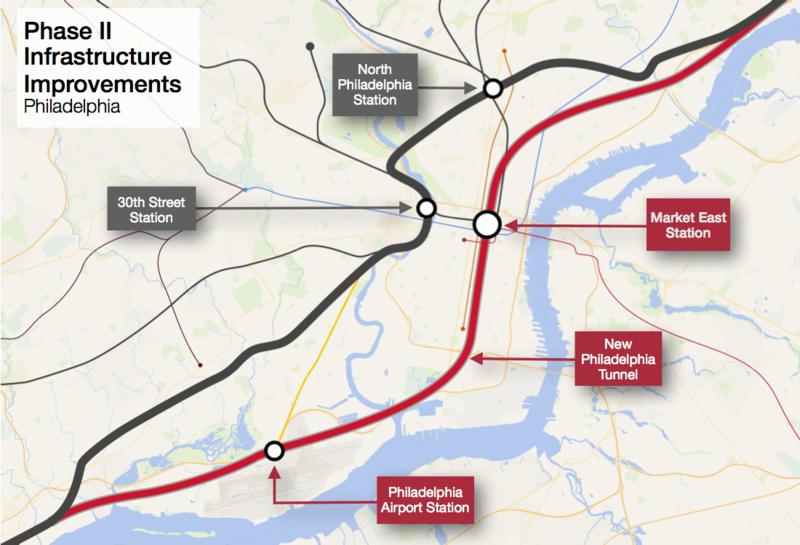 Phase II improvements to the southern section of the Northeast Corridor would involve the construction of a 20-mile bypass tunnel from the Tacony area of Northeast Philadelphia through the city center and Philadelphia Airport before rejoining the existing Northeast Corridor by Eddystone, PA. A new station would be constructed perpendicular to the current Market East Station. By relocating Philadelphia’s Northeast Corridor station to the urban core, travelers will have intermodal access to not only the central business district, but also a direct link to 15 regional and local rail lines. A new Philadelphia Airport Station would also be constructed to complement the ongoing expansion of the near-capacity airport. Overall, Phase II improvements to the southern section of the Northeast Corridor would allow for dramatic increases in speed as well as reduced congestion in some of the Northeast Corridor’s longest-standing bottlenecks. These improvements will complete a fully-separated express lane throughout the entirety of the southern section of the Northeast Corridor allowing high-speed trains to bypass traditional choke points caused by freight and commuter railroads. 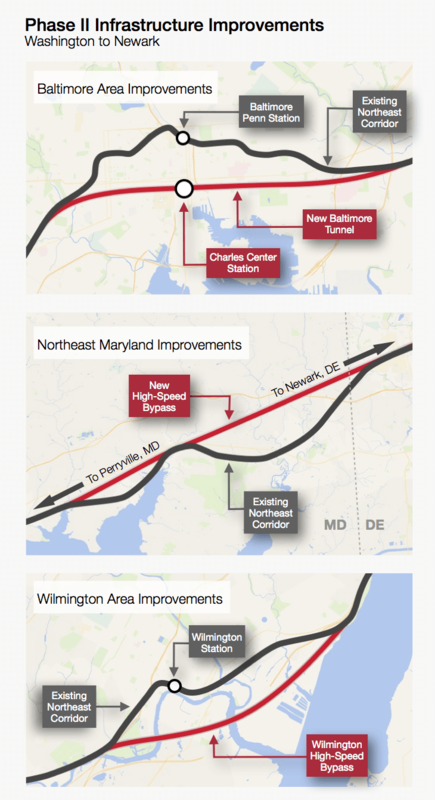 In comparison to Phase I, Phase II improvements would increase maximum speeds throughout the corridor to 220 miles-per-hour, thus reducing travel time from Washington to Newark to approximately 85 minutes.